Seaway Submarine by Universal Space (UNIS) is a super fun, educational game for children! 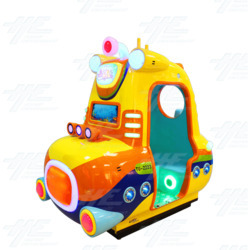 Have fun and learn at the same time when riding in their bright, attractive interactive Seaway Submarine. On board there are interactive option buttons, change the color of the sub on screen, add effects and go faster. A neat little educational game is also included, throw the net and when you catch the fish you learn the name of it and an interesting fact. Have fun and learn at the same time when riding in their bright, attractive interactive Seaway Submarine. On board there are interactive option buttons, change the color of the sub on screen, add effects and go faster. A neat little educational game is also included, throw the net and when you catch the fish you learn the name of it and an interesting fact.